From a distance, many view the massive turbines as majestic – as a clean, seemingly quiet and free source of endless energy. To untold thousands of families clustered within 2 kilometers (1.25 miles) or more of the pulsing machines, however, the IWTs bring strangely debilitating illness – increasingly incapacitating for some, yet scoffed at by wind proponents. Michigan State University noise engineers explain that “Inaudible components [ILFN] can induce resonant vibration in liquids, gases and solids … bodily tissues and cavities – potentially harmful to humans.” A subject in the groundbreaking Cooper study describes how the resonance shows up in a glass of water on her kitchen table, and in the toilet bowl, and how she feels it in her body. In addition to the impact of ILFN radiation, turbine neighbors suffer from Turbine “Flicker” – a strobe-like effect caused by turbine blades alternately blocking and allowing sunlight to skim rhythmically and repeatedly across the land, or ricochet in bursts across interior walls and stairwells. The direct impact extends to nearly a mile from the turbine – long after sunrise, and again long before sunset. It is mesmerizing, disorienting, and often brings on nausea, dizziness, lightheadedness, irritability, even panic, indoors or outside. Reliance on wind actually increases emissions and fossil fuel use overall, due to inefficiencies introduced into the system. Big Wind eliminates none of the need for conventional capacity, but rather consumes vast quantities of additional fuel and raw materials, while spewing emissions during the manufacture, transportation, construction and maintenance of the enormous redundant turbines and their uniquely demanding infrastructure. The Wind Game is nothing but an obscenely costly, mostly useless energy redundancy scheme. It funnels unimaginable profits from our taxpayer and rate-payer pockets to its inner circle, while knowingly ignoring its victims’ desperate pleas for relief – and indeed ridiculing them and trying to bury all the growing evidence of harm to their health and wellbeing. Wind Pushers Struggle to Avoid Accountability…. In Falmouth residents of the multiple lawsuits are seeking protection from adverse health effects, and loss of use and value of their property, by requiring illegally permitted wind turbines be placed away from their properties. 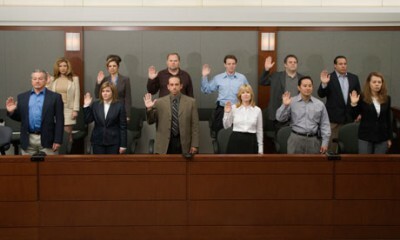 A motion in limine is a motion filed by a party to a lawsuit which asks the court for an order or ruling limiting or preventing certain evidence from being presented by the other side at the trial of the case. The town is asking to exclude expert testimony of Dr. Robert McCunney ? 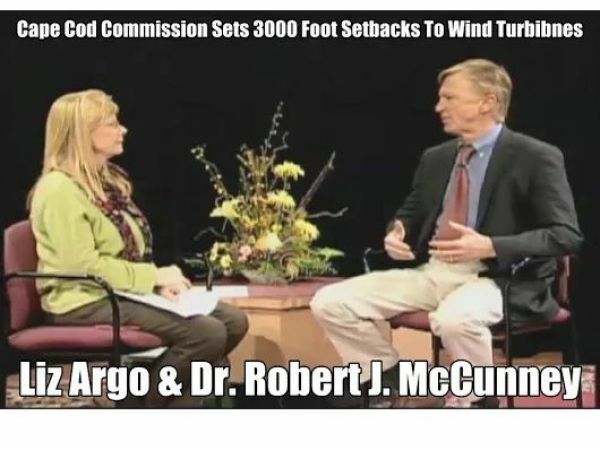 Isn’t Dr. Robert McCunney the expert witness for the Town of Falmouth wind turbine number one ? The original court file date is June 5, 2013. 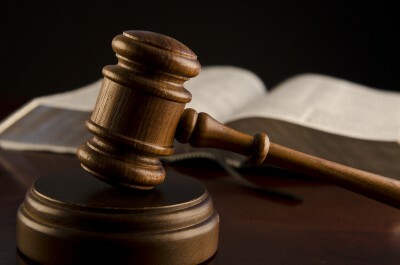 The case number is 1372CV00281 Town of Falmouth vs. Falmouth Zoning Board of Appeals et al. I am no legal scholar but it appears from the posting on the court docket the Town of Falmouth is asking the courts to throw out testimony from their own wind turbine expert a doctor ? Over time as the Falmouth wind turbine lawsuits have dragged through the court system for six years worldwide the setbacks are increasing and even doctors have changed their views on setbacks because of human annoyance or today what is called infra sound or low frequency noise. Nils Bolgen the wind turbine director at the Massachusetts Clean Energy Center uses 2000 feet as the standard setbacks today. Falmouth taxpayers are paying up to $300,000.00 every six months for wind turbine litigation and this is the strategy ? The Cape Cod Commissions wind turbine rules today are nearly identical to expert testimony which is hard evidence to overcome.Dr. Robert McCunney (expert witness for the Town Of Falmouth) graphical presented to the board why nearly 3000’ was necessary between industrial wind turbines and residents. The next time McCunney appeared on my radar was his July 15, 2010 appearance in Falmouth . It was a meeting before a number of people, some of whom had experienced first-hand the effects of living close to (in this case, just one!) a wind turbine. They were curious if their symptoms – all of which should be familiar to us by now – were due to the noise or were “in their heads”. His explanation indicated their symptoms were due to annoyance, which in turn was due to their dislike of turbines. He had no explanation why presumably disinterested kids as well as people on record as supporting turbines were also having problems. He also ignores the possibility that maybe the annoyance leads to the dislike instead of the wind industry’s preferred other way around.I thought his statements were disingenuous enough that I started a posting on his activities. Windpushers Cover Up the Truth About Wind Turbines! ‘Annoyance’ is a term much used, and frequently abused, in relation to the acoustic torture caused by incessant turbine generated low-frequency noise and infrasound. Those that abuse the term, including a former tobacco advertising guru, claim that the known and obvious effects of being immersed in thumping waves of pulsating air pressure (ie noise and vibration), night after merciless night (such as sleep deprivation) are all the product of fertile imaginations and/or scaremongering. Unfortunately for the guru and his shameful ilk, cases such as Clive and Trina Gare put paid to that lie. The Gares are cattle graziers with their home property situated between Hallett and Jamestown and, since October 2010, have played host to 19, 2.1MW Suzlon s88 turbines, which sit on a range of hills to the West of their stately homestead. Under their contract with AGL they receive around $200,000 a year; and have pocketed over $1 million since the deal began. On 10 June 2015, the Gares gave evidence to the Senate Inquiry into the great wind power fraud during its Adelaide hearing: [Hansard from the hearing is available here as HTML and here as a PDF (the Gare’s evidence commencing at p55)]. Their evidence destroys the wind industry lie that turbine hosts never, ever complain; and the propaganda that it’s only “jealous” wind farm neighbours who complain about wind turbine noise, “jealous” because they’re not getting paid, apparently. The Gares pocket $200,000 a year for the ‘pleasure’ of hosting 19 of these things; and, yet, make it very clear that it was the worst decision of their lives. No, they were waking me up on the weekend. You wake up to the thumping. This is with all the soundproofing in the house. As I said, I sleep with the radio on every night. If they are really cranked up I have to turn the volume up, so I will probably just go slowly deaf. In my opinion, towers should not be any closer than five kilometres to a dwelling. If we had to buy another property, it would not be within a 20-kilometre distance to a wind farm. I think that says it all. For more on the Gare’s experience, see our post here. As to the real meaning of the term ‘annoyance’ – in the realm of acoustics (which is what matters here) it has nothing to do with whether wind farm neighbours detest the look these things; and is all to do with hard-wired and involuntary neurological responses to a man-made stimuli received and processed in the brain. Waking up to a clap of thunder or the screaming siren of a smoke alarm is an integral part of a biological system designed to respond to unseen, nocturnal threats and to, thereby, keep itself alive. So far, so obvious. First, adverse health effects have been reported globally in the environs of wind turbines for more than 30 years with the old design and the new. Second, the wind energy industry has denied adverse health effects, preferring to call it ‘annoyance’ even though annoyance, however, is an adverse health effect. 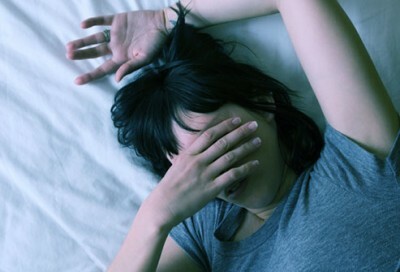 Certainly it is a non-trivial effect when sustained because it results in ‘sleep disruption’, ‘stress’ and ‘psychological distress’— those are direct quotes from others’ research. Third, annoyance is recognised and was treated by the World Health Organization as an adverse health effect, which is a risk factor for serious chronic disease including cardiovascular and cancer. Fourth, experts retained by the wind energy industry have preferred the diagnosis of nocebo effect to explain the adverse health effects, but the claim does not withstand critical scrutiny as there is a dose-response effect and nocebo does not have a dose-response effect. And there is a clear correlation between exposure and adverse health effects. Researchers have talked about dose-response. I should also comment that making that diagnosis without a comprehensive evaluation of a person or patient would qualify as non-practice, and I know that has been said in this committee before. One question though is what it is about wind turbine noise emissions, that makes them just so incredibly annoying? That question was taken up by a team of American researchers and the answer was published last month in the Journal of the Acoustic Society of America. This time, the work was done in the lab, with volunteers exposed for half-a-minute; rather than on unwilling victims subjected to a life-time of relentless sonic torture. To the wind industry’s countless victims, the results will come as no surprise. Current literature suggests that wind turbine noise is more annoying than transportation noise. To date, however, it is not known which acoustic characteristics of wind turbines alone, i.e., without effect modifiers such as visibility, are associated with annoyance. The objective of this study was therefore to investigate and compare the short-term noise annoyance reactions to wind turbines and road traffic in controlled laboratory listening tests. 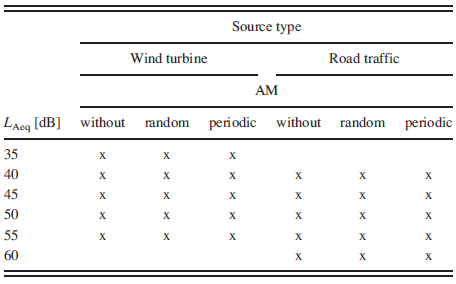 A set of acoustic scenarios was created which, combined with the factorial design of the listening tests, allowed separating the individual associations of three acoustic characteristics with annoyance, namely, source type (wind turbine, road traffic), A-weighted sound pressure level, and amplitude modulation (without, periodic, random). Sixty participants rated their annoyance to the sounds. 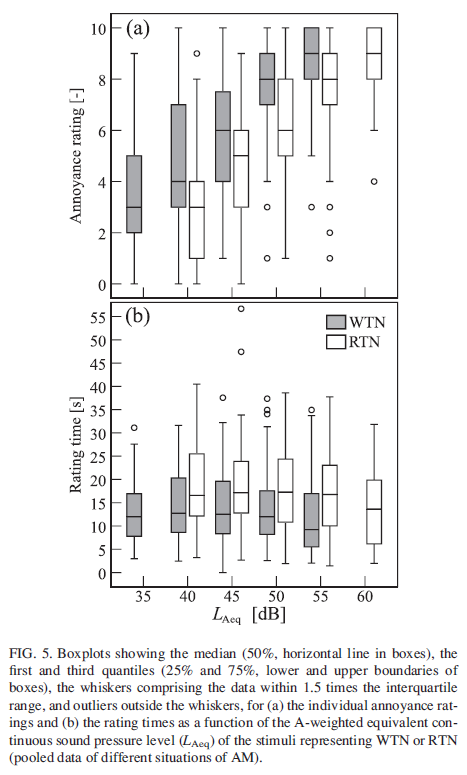 At the same A-weighted sound pressure level, wind turbine noise was found to be associated with higher annoyance than road traffic noise, particularly with amplitude modulation. The increased annoyance to amplitude modulation of wind turbines is not related to its periodicity, but seems to depend on the modulation frequency range. The study discloses a direct link of different acoustic characteristics to annoyance, yet the generalizability to long-term exposure in the field still needs to be verified. 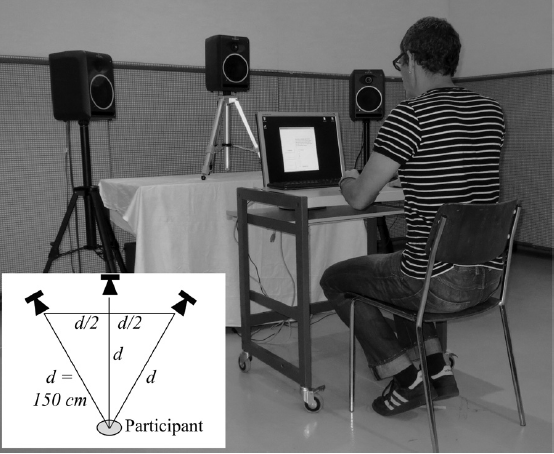 In this study the researchers recruited 60 participants (ages 18-60; median age 35 years; self reporting that they had normal hearing and felt well at the time of the experiment) and asked them to listen to 30 sounds (each 25 second long recordings) in a semi-sound proof room. The sounds had been synthesized to represent wind turbine noise or road traffic noise of equivalent A weighted sound pressure levels. Comparisons were made over a range of sound pressure levels and with different types of amplitude modulation. ‘Without amplitude modulation’ corresponds to a stationary noise. Wind turbine noise with periodic amplitude modulation represent situations with high-frequency swishing (normal amplitude modulation) as well as low-frequency thumping sounds (other amplitude modulation). 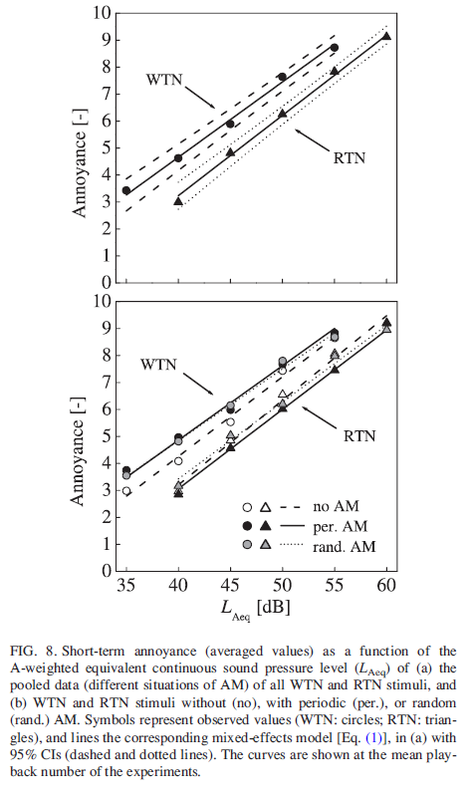 Random amplitude modulation is more typical of road traffic noise on streets with low or intermediate traffic density. The authors acknowledged that because that some of these noises (such as periodic traffic noise) would not necessarily occur in nature but were included for completeness in the study. At all sound pressure levels tested, the participants found that wind turbine noise was more annoying that its road traffic noise equivalent. They even looked at how long it took for the participants to record their annoyance – and in all tests wind turbine noise was found to be more annoying and at a much earlier time, when compared to road traffic noise. In fact, as participants listened to more samples of wind turbine noise they became increasingly more annoyed and formed their opinion quicker as they became accustomed to just how annoying wind turbine sounds could be. As part of their study they tried to prove that the characteristics of the participants were not playing a role in how annoying they were finding wind turbine noise. They were able to eliminate gender, age, how sensitive the person was annoyance in general, as well as their attitude towards the sources (wind turbine noise or road traffic noise). Wind turbine noise was just more annoying to everyone. They pooled the results and compared annoyance to the A weighted equivalent continuous sound pressure level with and without the different types of amplitude modulation. 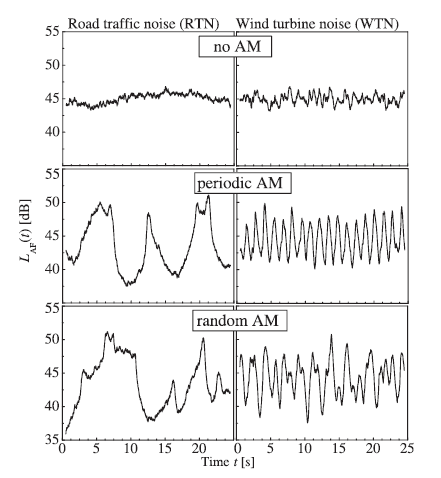 Periodic and random modulation of wind turbine noise increased the annoyance, but the same pattern could not be seen in road traffic noise. They concluded that the increased annoyance reaction to amplitude modulation of wind turbine noise was not related so much to the period, but more on the modulation frequency range. While the study has plenty of obvious limitations – subjects were only exposed to a short sound grab of 25 seconds – by way of comparison with road traffic noise, it vindicates wind farm victims and provides yet more objective proof to reject the wind industry’s nocebo nonsense, if any more was needed. Pretty hard to suggest that badgers suffering immune system destroying stress for the very same reasons – exposure to incessant wind turbine noise and vibration – are, somehow, victims of ‘suggestibility’ or their aesthetic take on these things. 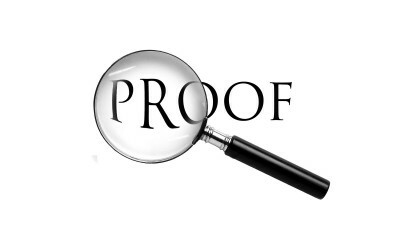 Slowly, but surely, the evidence supplants the lies and the myths. Corrupt Government Tries to Avoid Wind Turbine Investigation! Tom Harris of ICSC Explains Damage Done by “Climaphobia”! “For an increasing fraction of the world’s population, the real climate crisis is not the possibility that dangerous human-caused global warming may someday occur. It is the damage being caused today by government policies to supposedly mitigate climate change. Click here to see map of regions in Ontario that have come out opposed to the installation of industrial wind turbines (IWTs). Click here to visit Mothers Against Wind Turbines, the Web site of Shellie Correia, the mother of 15 year old Joey who took the picture to the right. Click here to watch a protest against IWTs in Toronto. Click on image above to enlarge! 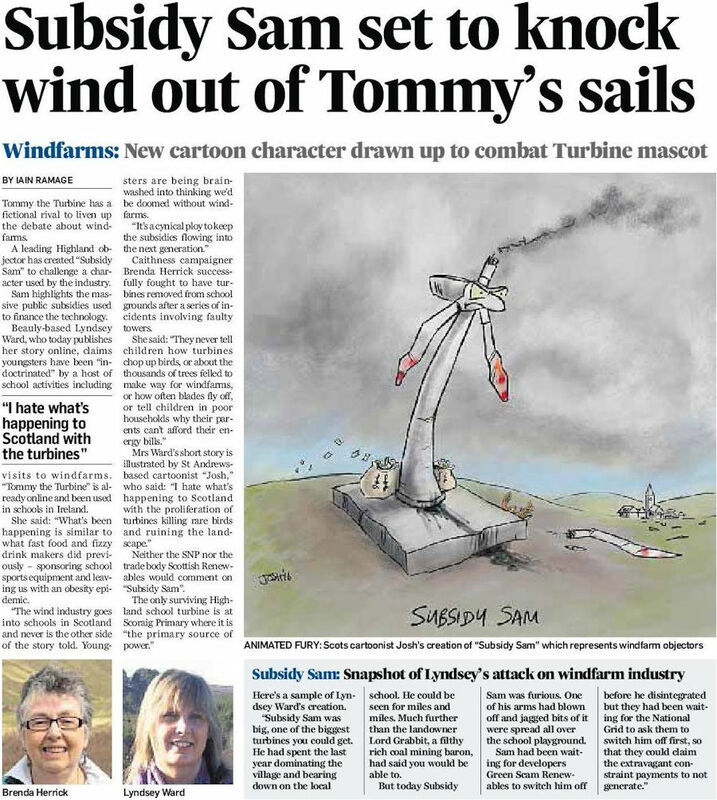 Subsidy Sam…..Hero of the WindScam! This short story has been written to counter the shameless wind propaganda that is allowed into our schools to influence young minds with no effort to show the other side. “Here at Wind Energy’s Absurd we have repeatedly challenged the wisdom and morality of allowing multinational companies into the classroom to put their side of a story that is designed to cultivate acceptance of their industry into future generations. 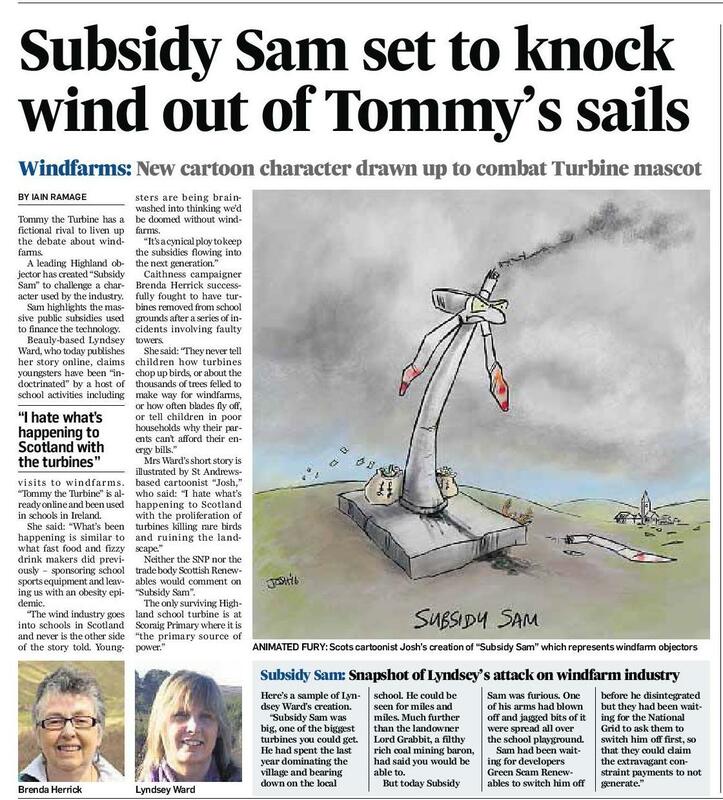 Well now Tommy has a rival – and ourMONEY is on Subsidy Sam getting the message out there. It is time the indoctrination of our children was stopped. We have been requested to post this story and are delighted to oblige. Please share it as many times as you want and send it wherever you want. Subsidy Sam was big, one of the biggest turbines you could get. He had spent the last year, since being built, dominating the village and bearing down on the local school, its pupils and staff. Sometimes you could even see him flailing his arms about but a lot of the time he didn’t. He was huge. So big he could be seen for miles and miles. Much further than the land owner, Lord Grabbit, a filthyRICH coal mining baron, had said you would be able to. He, with the developers Green Scam Renewables, had even shown pictures to the worried villagers of what Subsidy Sam would look like but it was really hard to see him in the misty distance in the developer’s photomontages. But today Subsidy Sam was furious. One of his arms had blown off and jagged bits of it were spread all over the school playground. It was so windy. Perhaps even a Force 9 gale. Sam had been waiting for Green Scam Renewables to switch him off before he disintegrated but they had been waiting for the National Grid to ask them to switch him off first, so that they could claim the extravagant constraint payments to not generate. 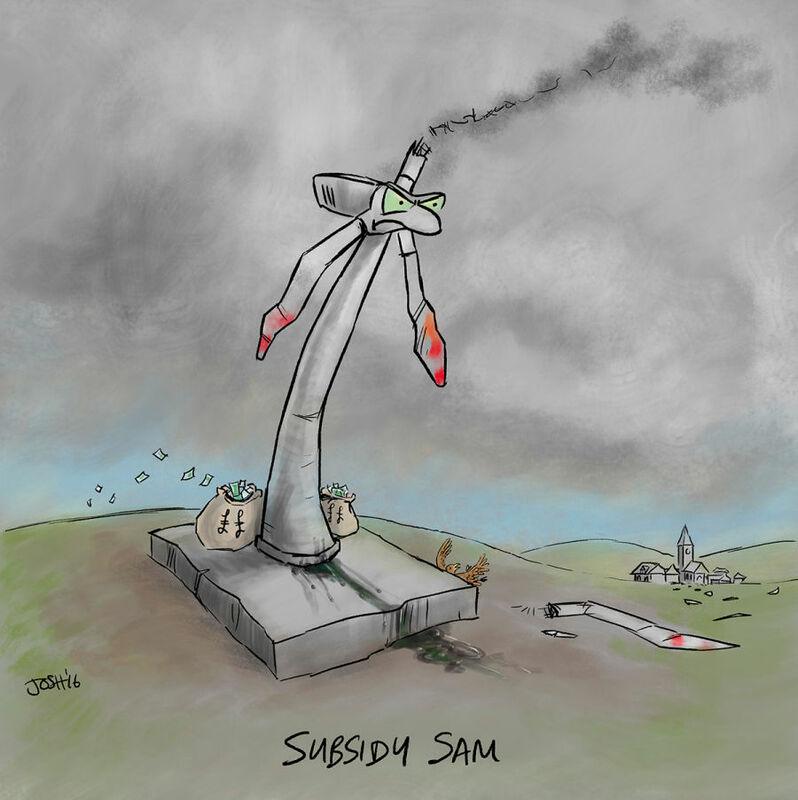 Green Scam Renewables had misjudged it today and now Subsidy Sam stood broken with one arm missing and the other two hanging forlornly at his side. It was a good job it wasn’t break time when the children would have been outside playing. With no enforced safety zone around this huge piece of industrial machinery and its whirling blades, it was very dangerous to be anywhere near him but no-one was telling the children that. Subsidy Sam was their friend and would help save the world. The nice wind developer man who owned Green Scam Renewables, Mr McWeasel, had told them that. He had come to the school with the jolly round man from the government who was wearing a tie with turbines all over it. They told the children that Subsidy Sam would save them and had frightened them all into thinking without him they were all doomed and the planet would die and so would they. It was scary stuff. It gave them nightmares. Thank goodness for Subsidy Sam. The French Head Mistress, Madame de Gaulle, was pleased to see Sam’s blade fly pass her studyWINDOW at such speed and smash into a thousand pieces. She was relieved that none of the children had been hurt but she was glad to see the broken turbine. ‘Good riddance’ she thought. She knew a waste ofMONEY when she saw it. She hated Subsidy Sam, or SS as she preferred to call him, and had put up strong resistance to him being built but to no avail. It made no difference that she objected when they pretended Sam was a community turbine. No-one in the community wanted Sam but deceiving the local authority into thinking he was one was the only way they would be allowed to build him. She’d heard of burly men going round the village telling people not to object or else. People were frightened so they didn’t. Now when the sun shone she had to close the blinds in her study to stop the strobing from Sam’s blades hitting her desk and giving her throbbing headaches. The compensation that was offered to the community by Green Scam Renewables was offensive. How can they pay anyone enough to make up for not being able to sleep at nights because of the incessant thumping when Sam was having a party and waving his arms in the air? Nothing could make up for that. Even the people who want to sell up and move away can’t because when the potential buyers see Subsidy Sam they don’t even get out of their cars. They just speed away without a backward glance. Once the foreign workers who built Subsidy Sam had left, the B&Bs and guest houses stayed empty, many people lost their jobs in the tourism industry because no-one came to visit any more. The birds were happy to see Subsidy Sam immobilised because it meant they no longer had to take their lives in their wings to feed at the nature class bird table every time they passed him when he was having one of his Edward Scissorhands on acid moments. The caretaker was pleased because he wouldn’t have to keep sweeping up all their feathers and body bits when they misjudged it. However, all the oil that was leaking down Subsidy Sam’s leg and seeping across the playground was hard to scrub off. The caretaker could never understand how a wind turbine so full of fossil fuels could ever be classed as clean and green. Still, the oil was a greenish black colour – perhaps that is what people meant. He was just a simple caretaker on minimum wage struggling to pay his energy bill with all these ‘green’ levies on them. What did he know? He had wanted to object to Subsidy Sam being built but he lived in a cottage on Lord Grabbit’s estate. It had been suggested to him that he shouldn’t object in case his home became no longer available to rent. Without his little cottage he wouldn’t have anywhere to live near where he worked, so he didn’t object. Mr McWeasel wasn’t pleased because since Subsidy Sam’s arm had been liberated he was unable to get the juicy subsidy for any energy the turbine might have managed to produce or the very lucrative constraint payments. He got those when he was told to switch Subsidy Sam off when there was low demand for electricity, too much wind and the grid was in danger of being overloaded and plunging everyone into darkness. Why should he care that Subsidy Sam was intermittent and unreliable and didn’t give any energy security? He got paid whatever. Mrs McWeasel wouldn’t be pleased either as she was expecting her usual two months holiday in the Bahamas, new top of the range set of wheels and that stunning diamond necklace she had set her heart on. Mr McWeasel would have a lot of explaining to do when he got home. After all he had guaranteed his lovely young wife a life ofRICHES and leisure all paid for by the spoils from Subsidy Sam. It was no matter to him that fuel poverty had increased because the supplements to pay Sam’s subsidies had been added to the energy bills of everyone, even the poor, the elderly and the sick. No matter to him either that the children and staff were in danger every day from Subsidy Sam’s flying components, that the birds were being sliced and diced, the bats were exploding, the leaking oil was polluting the school yard or that the lights were frequently going out so that the caretaker had to crank up the polluting diesel generator. None of that concerned Mr McWeasel or the politicians he had hoodwinked into believing his windy propaganda. They were so stupid even Mr McWeasel couldn’t believe he had got away with the wind con for so long. Still, that looked like it had all come to an untimely end with Subsidy Sam now broken and useless. No more subsidies available for new Sams because that pesky government over the border had stopped filling the subsidy trough. ‘Ah well,’ sighed Mr McWeasel. It was time to move onto other things. He had heard that there were good returns and subsidies operatingBANKS of noisy toxic fume-belching diesel generators now. All needed because the politicians had over-deployed on the weather-dependent subsidy suckers and under-deployed on reliable generation. He would need to speak to Lord Grabbit and see if he could build them where Sam was, near the school. Mrs McWeasel would still get her holiday, herNEW CAR and her diamonds. Mr McWeasel might even treat himself to that yacht he had always wanted as well. Saving the planet was no longer a priority – was it ever, Mr McWeasel?